Xerox WorkCentre 5890i multifunction printer that can print quickly, copy, scan and send the fax. Equipped with a 1GHz processor, 250GB hard drive and 2GB memory. The first-page time is 2.9 seconds. PCL and PostScript standards and XPS is optional. Standard connectivity includes USB, Ethernet and Wi-Fi. Each device has an 8.5 "panel that can be customized with one touch workflow. With tabloid size paper (11 "x 17"), finishing and high-speed options, the WorkCentre 5890i provide a scalable offering for a multifunction-oriented production environment. 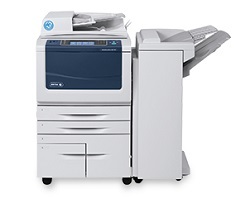 WorkCentre 5890i offers mobile printing and scanning. Standard mobile support includes Apple AirPrint apps, @PrintByXerox, Xerox App Gallery apps and QRCode. Mopria certified smartphones are also supported. Xerox Mobile Print, Xerox Mobile Print Cloud and Xerox Easy Translator Service are optional. Xerox WorkCentre 5890i includes many standard security features, such as embedded McAfee anti-virus solutions, hard disk overwriting, 256-bit encryption, secure printing, fax and scans, network authentication and user permissions, to name a few. Optional features are Xerox PrintSafe software, McAfee integrity control and Smart Card empowerment kit. Download the Xerox WorkCentre 5890i driver according to the Operating System on your PC or laptop at the link below.